At the bottom is a more recent article that backs Hansen up. The unusual stability of the Earth’s climate during the Holocene is probably due to the fact that the Earth has been warm enough to keep ice sheets off North America and Asia, but not warm enough to cause disintegration of the Greenland or Antarctic ice sheets. ‘Fast-feedbacks’, including changing water vapor, clouds, sea ice, aerosols (dust, airborne organic particles, etc.) and effects of aerosols on clouds, determine climate response on decadal time-scales. Thick ice sheets provide not only a positive feedback, but also the potential for cataclysmic collapse, and thus an explanation for the asymmetry of the ice ages. The albedo flip property of ice/water provides a trigger mechanism. If the trigger mechanism is engaged long enough, multiple dynamical feedbacks will cause ice sheet collapse. We argue that the required persistence for this trigger mechanism is at most a century, probably less. An ice sheet in equilibrium may have summer melt on its fringes, balanced by interior ice sheet growth. Large climate change will occur only if a forcing is sufficient to initiate rapid dynamical feedbacks and disintegration of a substantial portion of the ice sheet. Rapidly rising temperatures in the past three decades is evidence that the Earth is now substantially out of energy balance and indications of accelerating change on West Antarctica and Greenland indicate that the period of stability is over. Civilization developed, and constructed extensive infrastructure, during a period of unusual climate stability, the Holocene, now almost 12 000 years in duration. That period is about to end. The imminent peril is initiation of dynamical and thermodynamical processes on the West Antarctic and Greenland ice sheets that produce a situation out of humanity’s control, such that devastating sea-level rise will inevitably occur. Climate forcing of this century under Business-As-Usual (BAU) would dwarf natural forcings of the past million years, indeed it would probably exceed climate forcing of the middle Pliocene, when the planet was not more than 2–3 8 C warmer and sea level 25 G 10 m higher. Such warming would assuredly activate the albedo-flip trigger mechanism over large portions of these ice sheets. In combination with warming of the nearby ocean and atmosphere, the increased surface melt would bring into play multiple positive feedbacks leading to eventual nonlinear ice sheet disintegration. It is difficult to predict time of collapse in such a nonlinear problem, but we find no evidence of millennial lags between forcing and ice sheet response in palaeoclimate data. An ice sheet response time of centuries seems probable, and we cannot rule out large changes on decadal time-scales once wide-scale surface melt is underway. The gravest threat we foresee starts with surface melt on West Antarctica and interaction among positive feedbacks leading to catastrophic ice loss. Warming in West Antarctica in recent decades has been limited by effects of stratospheric ozone depletion. However, climate projections find surface warming in West Antarctica and warming of nearby ocean at depths that may attack buttressing ice shelves. Loss of ice shelves allows more rapid discharge from ice streams, in turn a lowering and warming of the ice sheet surface, and increased surface melt. Rising sea level helps unhinge the ice from pinning points. West Antarctica seems to be moving into a mode of significant mass loss. Our concern that BAU GHG scenarios would cause large sea-level rise this century Hansen 2005 differs from estimates of IPCC 2001, 2007, which foresees little or no contribution to twenty-first century sea-level rise from Greenland and Antarctica. However,the IPCC analyses and projections do not well account for the nonlinear physics of wet icesheet disintegration, icestreams and eroding iceshelves, nor are they consistent with the palaeoclimate evidence we have presented for the absence of discernable lag between ice sheet forcing and sea-level rise. We announced that we had collected enough observations to conclude that the retreat of ice in the Amundsen sea sector of West Antarctica was unstoppable, with major consequences – it will mean that sea levels will rise one metre worldwide. What’s more, its disappearance will likely trigger the collapse of the rest of the West Antarctic ice sheet, which comes with a sea level rise of between three and five metres. Such an event will displace millions of people worldwide. We find it implausible that BAU [‘business-as-usual’] scenarios, with climate forcing and global warming exceeding those of the Pliocene, would permit a West Antarctic ice sheet of present size to survive even for a century. Such science was excluded from “mainstream” reports such as those of the IPCC, which systematically and embarrassing underestimated likely sea-level rises, with the most recent, 2013 report being no exception. It’s so dumb, but putting politics ahead of science has got us into this mess, and there is little sign that even peer-reviewed evidence that West Antarctic has passed a tipping point for partial or total collapse of its ice sheets will get those in power to acknowledge scientific reality. So here, for the record, is what we said back in late 2007. Big changes are also underway at the other end of the world, in the Antarctic, where most of the world’s ice sits on the fifth largest continent. The majority of Antarctic ice is contained in the East Antarctic ice sheet — the biggest slab of ice on Earth, which has been in place for some 20 million years and which, if fully melted, would raise sea levels by more than 60 metres. Considered more vulnerable is the smaller West Antarctic ice sheet, which contains one-tenth of the total Antarctic ice volume. If it disintegrated, it would raise sea levels by around 5 metres, a similar amount to what we would see with a total loss of the Greenland ice sheet. While it was generally anticipated that the West Antarctic sheet would be more stable than Greenland at a 1–2 degree rise, recent research demonstrates that the southern ice shelf reacts far more sensitively to warming temperatures than scientists had previously believed. Ice-core data from the Antarctic Geological Drilling joint project (being conducted by Germany, Italy, New Zealand, and the United States) shows that ‘massive melting’ must have occurred in the Antarctic three million years ago, during the Miocene–Pliocene period, when the average global temperature in the oceans increased by only 2–3 degrees above the present temperature. Geologist Lothar Viereck-Götte called the results ‘horrifying’, and suggested that ‘the ice caps are substantially more mobile and sensitive than we had assumed’. 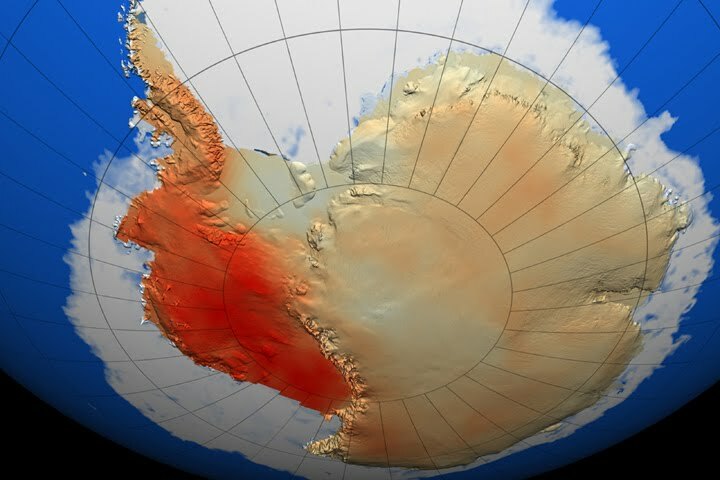 The heating effect caused by climate change is greatest at the poles, and the air over the West Antarctic peninsula has warmed nearly 6 degrees since 1950. At the same time, according to a report in the Washington Post on 22 October 2007, a warming sea is melting the ice-cap edges, and beech trees and grass are taking root on the ice fringes. Another warning sign was the rapid collapse in March 2002 of the 200-metre-thick Larsen B ice shelf, which had been stable for at least twelve thousand years, and which was the main outlet for glaciers draining from West Antarctica. An ice shelf is a floating sheet, or platform, of ice. Largely submerged, and up to a kilometre thick, the shelf abuts the land and is formed when glaciers or land-based ice flows into the sea. Generally, an ice shelf will lose volume by calving icebergs, but these are also subject to rapid disintegration events. Larsen B, weakened by water-filled cracks where its shelf attached to the Antarctic Peninsula, gave way in a matter of days, releasing five hundred billion tonnes of ice into the ocean. Neil Glasser of Aberystwyth University and Ted Scambos from the NSIDC found that as glacier fl ow had begun to increase during the 1990s, the ice shelf had become stressed. The warming of deep Southern Ocean currents (which increasingly reach the Antarctic coastline) had also led to some thinning of the shelf, making it more prone to breaking apart. Scambos concludes that ‘the unusually warm summer of 2002, part of a multi-decade trend of warming [that is] clearly tied to climate change, was the final straw’. Much of the West Antarctic ice sheet sits on bedrock that is below sea level, buttressed on two sides by mountains, but held in place on the other two sides by the Ronne and Ross ice shelves; so, if the ice shelves that buttress the ice sheet disintegrate, sea water breeching the base of the ice sheet will hasten the rate of disintegration. In 1968, the Ohio State University glaciologist John Mercer warned, in the journal of the International Association of Scientific Hydrology, that the collapse of ice shelves along the Antarctic Peninsula could herald the loss of the ice sheet in West Antarctica. A decade later, in 1978, his views received a wider audience in Nature, where he wrote: ‘I contend that a major disaster — a rapid deglaciation of West Antarctica — may be in progress … within about 50 years.’ Mercer said that warming ‘above a critical level would remove all ice shelves, and consequently all ice grounded below sea level, resulting in the deglaciation of most of West Antarctica’. Such disintegration, once under way, would ‘probably be rapid, perhaps catastrophically so’, with most of the ice sheet lost in a century. Credited with coining the phrase ‘the greenhouse effect’ in the early 1960s, Mercer’s Antarctic prognosis was widely ignored and disparaged at the time, but this has changed. Another vulnerable place on the West Antarctic ice sheet is Pine Island Bay, where two large glaciers, Pine Island and Thwaites, drain about 40 per cent of the ice sheet into the sea. The glaciers are responding to rapid melting of their ice shelves and their rate of fl ow has doubled, whilst the rate of mass loss of ice from their catchment has now tripled. NASA glaciologist Eric Rignot has studied the Pine Island glacier, and his work has led climate writer Fred Pearce to conclude that ‘the glacier is primed for runaway destruction’. Pearce also notes the work of Terry Hughes of the University of Maine, who says that the collapse of the Pine Island and Thwaites glaciers — already the biggest causes of global sea-level rises — could destabilize the whole of the West Antarctic ice sheet. Pearce is also swayed by geologist Richard Alley, who says there is ‘a possibility that the West Antarctic ice sheet could collapse and raise sea levels by 6 yards [5.5 meters]’, this century. The gravest threat we foresee starts with surface melt on West Antarctica, and interaction among positive feedbacks leading to catastrophic ice loss. Warming in West Antarctica in recent decades has been limited by effects of stratospheric ozone depletion. However, climate projections find surface warming in West Antarctica and warming of nearby ocean at depths that may attack buttressing ice shelves. Loss of ice shelves allows more rapid discharge from ice streams, in turn a lowering and warming of the ice sheet surface, and increased surface melt. Rising sea level helps unhinge the ice from pinning points … Attention has focused on Greenland, but the most recent gravity data indicate comparable mass loss from West Antarctica. We find it implausible that BAU [‘business-as-usual’] scenarios, with climate forcing and global warming exceeding those of the Pliocene, would permit a West Antarctic ice sheet of present size to survive even for a century. Even in East Antarctica, where total ice loss would produce a sea-level rise of 60 metres, mass loss near the coast is greater than the mass increase inland (mass increase inland is caused by the extra snowfall generated from warming-induced increases in air humidity). While the inland of East Antarctica has cooled during the last 20 years, the coast has become warmer, with melting occurring 900 kilometers from the coast and in the Transantarctic Mountains, which rise up to an altitude of 2 kilometers. Research published in January 2008 by Rignot and six of his colleagues shows that ice loss in Antarctica has increased by 75 per cent in the last ten years due to a speed-up in the flow of its glaciers, so that the ice loss there is now nearly a great as that observed in Greenland. This entry was posted in Climate Change, Sea Level Rise. Bookmark the permalink.